On Thursday of the last week of term Adrian Beck co-author of the Kick it to Nick football books popped into the LRC with signed copies of books for some lucky students. 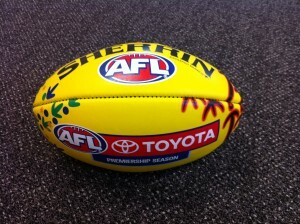 Little did I know that Adrian had another big surprise for us when he opened a box to reveal a limited edition football from this year’s AFL Indigenous Round. The Indigenous Sherrin football symbolises the celebration of all Aboriginal and Torres Strait Islander players. The lizard men depict groups of men outstretched, emphasising high marking which is a unique feature of both Mangrook and the modern game. The feet-like tree roots of the lizard men represent the strong links to country and the traditional game of Mangrook. The images are inspired by the Rock Art shelters in the Gariwerd Ranges (Grampians) in Tjap Whurrong country in Victoria. Adrian thought this football could make a great prize for a Reading Challenge. 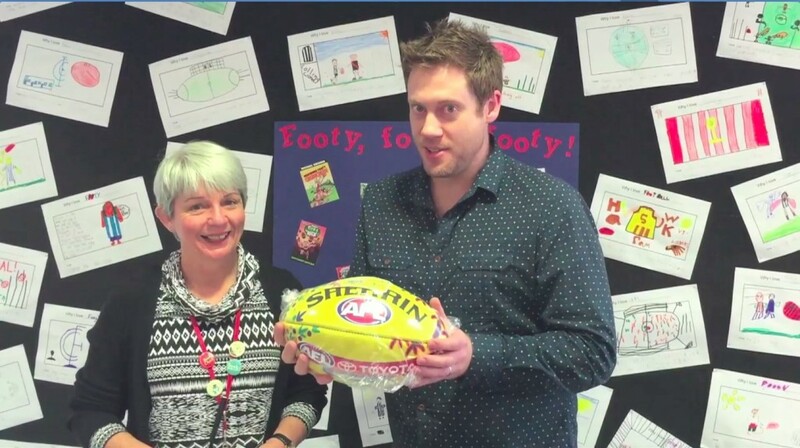 “What a brilliant idea!” I said and before I knew it Adrian had whipped out his phone to record us for a video for what he creatively named The Yeo-low Medal – (a play on my surname) and a close relation to the Brownlow Medal but for the best and fairest readers! Next job for me was to create a Reading Challenge that would be fun and encourage everyone to read a variety of books this term. 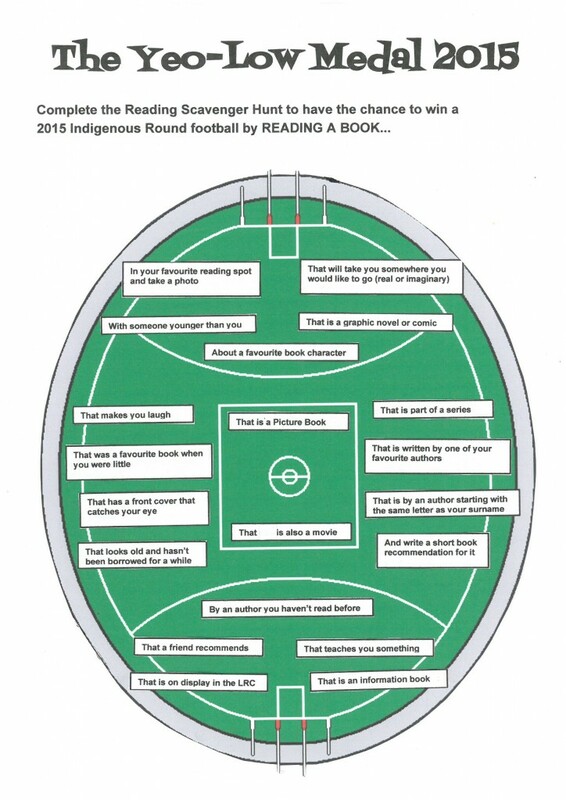 A big thank you the MPMK website that helped spark my ideas for our footy-themed Reading Scavenger Hunt. This entry was posted in Uncategorized and tagged Football, Reading, Scavenger Hunt by smotlrcblog. Bookmark the permalink. I am so excited about this! I’m sure it is going to inspire lots more kids that like sport to read. What a great idea! We are very lucky to have connected with Adrian! If the enthusiasm shown about the ‘Yeo-Low Medal’ by today’s classes is any indication then I think we are in for a fun term of reading! I was so pleased when the Year 4 and 5 classes in the LRC today were very excited about the Reading Scavenger Hunt for the “Yeo-Low Medal’. I’m looking forward to telling all of the classes about it. I hope ‘The Yeo-Low’ inspires lots of reading this term! Wow what a fabulous idea. I’m sure there is lots of excitement around the school in relation to the Yeo-low Medal. Adrian is clever with words and very generous. Thanks Miss Y for organising this fun reading challenge. There’s a definite ‘Reading Buzz’ in the air Mrs S which as you know makes my heart sing! Sounds perfect Miss Y. Fancy having a medal named after you! What lucky children at your school and what fun they’ll have completing the challenge. I am very chuffed to have a medal named after me, especially one that has to do with reading! Adrian was very clever to think of it. I hope our students will have lots of fun completing our reading challenge. Some have started already in the LRC at lunchtime today! Just wanted to say this was a great idea and I am not doing it for the footy but just for fun. I’m thrilled to hear you are joining in for fun – a perfect reason to read!